Woofer Magnet Weight: 25 oz. The Disco Jam Stereo Speaker Systems were made to pump up the party. Play your favorite tracks as loud as you want and with style. Disco Jam speakers feature impressive high-power output and flashing DJ lights that will add life to any occasion. Use them at home, on stage or in the auditorium. They're perfect for any get together and will make you feel like a true DJ once the music plays. The PSUFM1030P features 1000 watt output, dual 10'' subwoofers, dual 3'' piezo tweeters, ported enclosure for added bass response, and plenty more great features. Get the party going with the Disco Jam Speaker Systems. Does this come with the wired yellow rca plug as shown in the picture? The description says otherwise. can you connect bluetooth or with an aux cord? 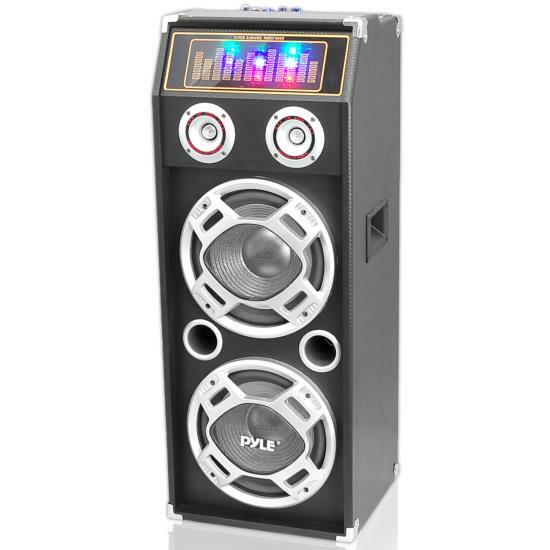 This is a passive speaker, it has no amplifier or stereo, you will need to purchase the Pyle PSUFM1035A with it as a set to have any Bluetooth or aux inputs.